VALENTINE'S DAY SALE! SAVE BIG THROUGH FEB 20th! Because I love you, I am offering a deep discount on my video course. For such a small investment you can feel more confident and at ease by speaking French without your English language accent. "Let me say how much I am enjoying your course, and how much I appreciate the progress that I have been able to make since subscribing. I have heard you say that you have a unique teaching style, and I must agree. I have been learning French in various countries over about 15 years, and yours is the most helpful approach I have ever found. I also enjoy your enthusiasm, which is infectious!" $99Through February 20th! Don't miss out! You Have Nothing to Lose Except Your English Accent! Lesson 1: Introduction to the International Phonetic Alphabet (IPA) These symbols are the best way to describe a sound and all the course exercises are written in phonetic symbols, so this lesson gets everyone on the same page. Open Syllabication—the French habit of ending each syllable in a vowel which is also key to developing an authentic accent. These 2 topics are the heart and soul of the course. Lesson 3: French vowels. A detailed description of each French vowel sound and specifically how and where they are made in the mouth. Since French emphasizes vowels over consonants, this lesson is foundational. Lesson 4: Vowels continued: the mute e—one of the most interesting and challenging French sounds, teaching when it is pronounced and when it falls; and a study of the French vowels that are sometimes pronounced more open and sometimes more closed and how to make the distinction in contemporary French. Lesson 5: A detailed description of each French consonant sound and specifically how and where they are made in the mouth; special attention to the challenging French “r”. Lesson 7: How to avoid the English habit of nasalizing all vowels and learning that the French do just the opposite. Visuals of the French and English mouth to explain the process. This is a feature that most speakers of French are totally unaware of, but it really affects the quality of your accent. Lesson 8: A look at how the accentuation of English affects the rhythm of our sentences, and how to avoid carrying over these habits when we speak French. This informative article shared from French Today is especially appropriate for the PronouncingFrench website since we specialize in sounds. This fun blog gives the sounds that the French language uses to imitate real sounds, or onomatopoeia (maybe you remember that term from poetry units in your English classes.) So whereas in English we say “shhhh” for “be quiet”, the French say “chut”. The last entry also offers a charming video of a mother and her baby to illustrate the word for “cooing”. For all those who would like to sound more French! I am dedicated to helping improve the quality of spoken French among teachers, students and all who wish to sound more authentic when speaking this beautiful language. To this end I have produced--so far--over 40 mini video lessons found on You Tube. These little lessons teach not just how to pronounce the vowels and consonants of French, but also are an introduction to the larger work I have created, Mastering French Pronunciation, an 8-chapter video course. 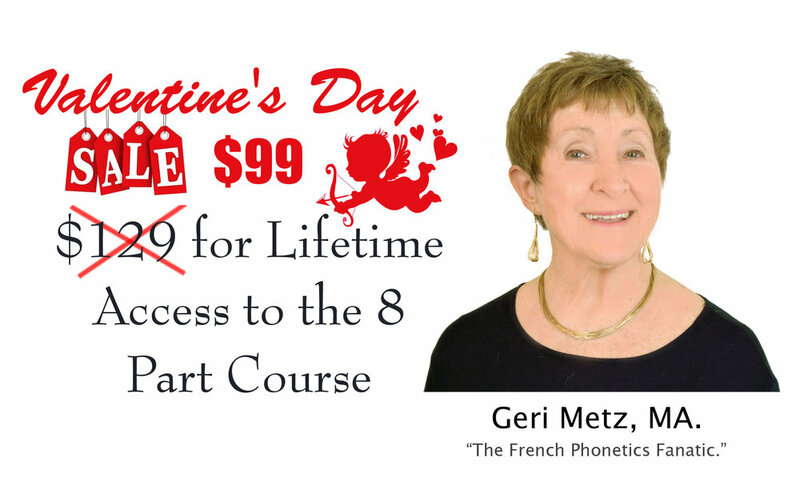 This course is my “labor of love” in which I unlock the code to what the French do to sound French! Do check it out on the website. I will be posting some of these videos on my blog, so enjoy these mini lessons which are an introduction to the in depth material taught in the course. My heart is particularly open to teachers of French who with this course will have the tools to continue their professional development and become even better models for their students. I would love to hear from my readers: please comment on difficulties you have in French pronunciation, words you would like to see included in my Word of the Week or Hard Words in French series, and just feedback, etc. Enjoy!